Did you see that story last Wednesday about the rat trapped for several hours before finally being freed? And then the next day he had to return and go through the whole ordeal again, this time behind closed doors at the US Congress House Intelligence Committee. Lies and greed was what kept Michael Cohen stuck in front of a committee which was half-supportive, half-hostile, depending which side of the aisle was approaching the about-to-be jailed lawyer. 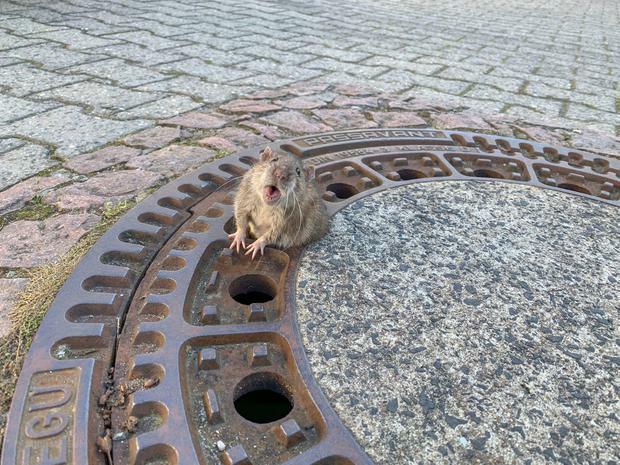 And then there was the story of the little critter of the genus rattus, which got stuck in a manhole cover in Bensheim in Germany and had to be rescued by an eight-person crew of local volunteer firefighters. Anyone who keeps hens knows all about rats. And I keep hens, so I have encountered the little blighters frequently over the years. Going out in the evenings to lock up the fowl, you will sometimes find an Irish rat munching on any spilled hen food still on the ground. The rats we are most familiar with are the Norwegian brown rat sometimes known at the Irish rat, and they are actually a handsome little creature with a white blaze on the chest. Of course they don’t look good when wet, but then the drowned rat look is not flattering on any of us. All the negative stereotypes about rats are true, like the fact that they are omnivorous and will eat anything, even you if you stay still long enough. That’s what made them such a dread to the soldiers in the trenches of World War I. That is why you will find them as likely in a sewage treatment plant as in a grain store. And consequently they do spread disease, through their predecessors the black rat or ship’s rat, which they replaced in Ireland about 250 years ago, got a bum rap for the bubonic plague which was actually spread by fleas. But they are aggressive and if cornered will attack. I once saw one member of the species boxed in, try to leap for the throat of a neighbour. Unfortunately for rattus, the neighbour was a member of an even more dangerous genus, he was a former Galway hurler and was carrying his implement, with which he hurled the attacking rat into the next parish. Anyone reporting a sighting of a rat in this country seems incapable of avoiding exaggeration. They are invariably described as having been as big as cats, but they never are. However, they are numerous, breeding all year round with litters of up to a dozen. There is a belief that you are never more than 10ft away from a rat at any time, but that seems a bit much unless you include the two-legged kind. That in turn makes you think that much as we are not fans of rattus, we might find it easier to have something good to say about them than about the likes of Mr Trump and Mr Cohen. Rattus, for example, is intelligent, though we rarely give them credit for it except in a pejorative way, like referring to the rat cunning. Indeed nearly every reference to the rat is an insulting one, whether it is to a rat-arsed drunk, or a deserter or a turn coat or a strike breaker. I am sure when many of us grown-ups saw that picture of the fat rat stuck in the grate, we immediately thought we could solve that problem with the heel of the boot, rather than hours of diligent labour by a team of fire fighters. Their efforts led to the happy release of the not-so-little creature and its “return to the wild” which was not a euphemism, like we might use about a disappeared dog gone to live on a farm in the country.